We're living in the golden age of the gadget. Don't believe it? Check your pockets. Odds are you're carrying a portable music player, an electronic organizer, a keychain-size storage device, a digital camera, or a cell phone that combines some or all of these functions. And you'd probably be hard-pressed to live without them. At PC World, we'd be lost without these things. We don't merely test and write about digital gear, we live and breathe the stuff. 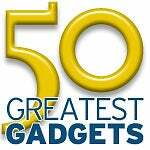 In honor of this raging gizmo infatuation, we polled our editors and asked them to name the top 50 gadgets of the last 50 years. The rules? The devices had to be relatively small (no cars or big-screen TVs, for example), and we considered only those items whose digital descendants are covered in PC World (cameras, yes; blenders, no). We rated each gadget on its usefulness, design, degree of innovation, and influence on subsequent gadgets, as well as the ineffable quality we called the "cool factor." Then we tallied the results. After a lot of Web surfing, spreadsheet wrangling, and some near fistfights, we emerged with the following list. Some items in our Top 50 are innovative devices that appeared briefly and then were quickly consigned to museums and future appearances on eBay, but whose influence spread widely. Others are products we use every day--or wish we could. So join us as we visit with the ghosts of gadgets past and present. Portable music players are so cheap and ubiquitous today that it's hard to remember when they were luxury items, widely coveted and often stolen. But when the blue and silver Walkman debuted in 1979, no one had ever seen anything quite like it. The $200 player virtually invented the concept of "personal electronics." The first Walkman (also branded as the Stowaway, the Soundabout, and the Freestyle before the current name stuck) featured a cassette player and the world's first lightweight headphones. 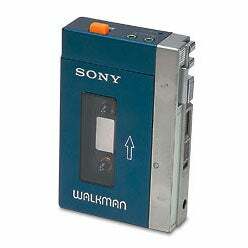 Apparently fearful that consumers would consider the Walkman too antisocial, Sony built the first units with two headphone jacks so you could share music with a friend. The company later dropped this feature. Now, more than 25 years and some 330 million units later, nobody wonders why you're walking down the street with headphones on. Learn more in Sony's history of the Walkman. PCW photo by Rick Rizner; Walkman courtesy of Melissa Perenson. Contributing Editor Dan Tynan writes PC World's Gadget Freak column. He is also author of Computer Privacy Annoyances (O'Reilly Media).